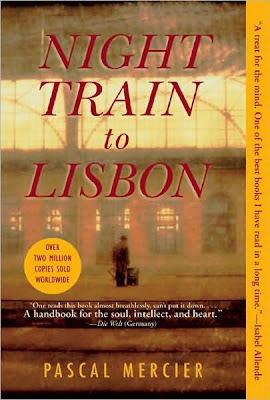 An edited version of this article was first published as Book Review: Night Train to Lisbon by Pascal Mercier on Blogcritics.org. Let me say from the outset that this is perhaps one of those books in which I cannot make up my mind, whether I like it or not. There were points about the book that I especially liked, but there were also aspects of the book that I found not to my liking. Thus, overall, I am ambivalent about this one. But first, let me tell you what this book is about. This book follows the adventures of Raimund Gregorius, who is a teacher at a Swiss Gymnasium. One rainy day, he encounters a woman who seems to be getting ready to jump off a bridge. Fearing that she is committing suicide, he goes to her and prevents the jump. He immediately learns that the woman is a foreigner, and when he asks her what language she speaks, she replies português. The woman does something strange; she writes a phone number on his forehead. Enamored by the strangeness of the woman, and the exotic nature of the pronunciation of português, he decides to check out a used-book store where he comes across a book that consists of a collection of notes of a certain Amadeu de Prado. And guess what? The overall impact of the weird encounter with the weird woman sets him off to this adventure. What was originally a very predictable and repetitive lifestyle was broken. He just takes off and leaves the school. He buys a train ticket to Lisbon, thus, taking the journey from Bern, which is what the title is referring to. After arriving in Lisbon, he sets off on this treasure hunt, trying to find out who this Amadeu de Prado is. It turns out that he was a doctor, who lived during the Portuguese authoritarian regime, who was loved by the people until he treated one of the authorities, which caused him to be ostracized by the people. Because of that, he secretly joined the resistance, with hopes of redeeming himself. Gregorius tries to meet all of the people that were related to Amadeu: his friends, his sister, a girl who had a crush on him, his professor, et cetera. At the same time, he tries to read the collection of notes that he has in the form of the used book he got in Bern. And little by little, Gregorius, and by extension, the reader, pieces together this puzzle that slowly reveals the totality of the personality behind the name of Amadeu de Prado. We learn of the social and emotional struggles and conflicts that Amadeu had, such as his atheism, his love triangles, his relationships with his parents. There are plenty to mention here, that I think it would just be better to pick up the book and read about it for a more accurate picture. So that shouldn't be a bad plot for a novel. Except there are things that I did not understand. So, first of all, what was the role of the woman in the beginning? The woman was about to jump from a bridge, and was rescued. After that, she doesn't appear at all in the novel. Gregorius decides to buy a train ticket to Lisbon, he decides to break his seemingly unbreakable routine of living in Bern (we are told later that his wife Florence took vacations without him because he hated flying), not because of the woman who left a phone number on his forehead, but because of a book he bought from a used book store. How incredible is that! Secondly, I never understood why Gregorius kept continuing in his personal investigation regarding Amadeu. Who exactly was Amadeu to Gregorius? It wasn't the case that he was some very important figure in history. No, he was just a doctor who had some emotional problems and had a gift for writing. I find a disconnect between the reviews that I have seen about this book and my own personal experience reading it. This book has been compared to Carlos Ruiz Zafon's Shadow of the Wind, which I have also read in the past. What is common between both books is that there is the main character who embarks on an investigation about an author of a seemingly rare book. In Shadow of the Wind, the main character also picks up a book, and finds out that there is nothing else he can find out about the author. It seems that the book he found was the only book the author wrote. The similarity ends here, however. In Shadow of the Wind, there is a reason why the main character continues on the expedition, that is, apparently, there is an antagonist, the Devil, who seems to be hunting every copy of every book that the author has wrote and burns them. In Night Train to Lisbon, I see no motive for continuing the pursuit, aside from the inference that something clicked in Gregorius' head that he decided to break his routine and embark on an adventure. So overall, after having ambivalent thoughts about this book, I decided that I do not like it. Maybe it is the hype that I think it doesn't deserve that gives me this negative reaction, but I think it's a book that didn't live up to its reputation. 3 out of 5 stars.